DANIEL MACLISE autograph Letter Signed. ALS. 2pp bifolium. 14 Russell Place, Fitzroy Square. August 29th 1856. To "Dear Sir" (probably Thomas Miller). 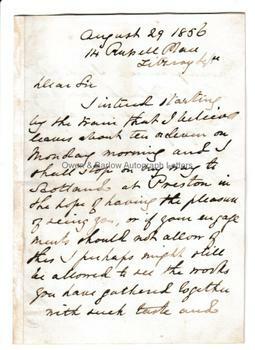 "I intend starting by the train that I believe leaves at ten or eleven on Monday morning and I shall stop on my way to Scotland at Preston in the hope of having the pleasure of seeing you, or if your engagements should not allow of this I perhaps might still be allowed to see the works you have gathered together with such taste and munificence. I did not think I should have been able to leave so soon as the 1st of Septr with the sportsmen, altho' not much of one myself. Believe me, very faithfully yours, D. Maclise." 16mo. 13 x 9 cms (5.25 x 3.5 inches). Some mounting traces to verso of blank leaf, else near fine. Provenance: From the 19th century album of Emma Marshall of Penwortham Lodge, Preston. Emma was the daughter of William Marshall, landowner and cotton manufacturer and was related by marriage to the Miller family of Baronets, M.P.s and landowners. Thomas Miller (to whom this letter is most probably addressed) was a keen art collector and was the purchaser of Millais' 'The Peace Concluded' and other important works.